The Chain Pier, West Pier and Palace Pier opened in 1823, 1866 and 1899 respectively. With three piers having been built in Brighton, it is very easy to forget that Worthing also has a pier – a very good one in fact. The 960ft Worthing Pier opened in April 1862 to the designs of Robert Rawlinson (later Sir Robert) for the Worthing Pier Company. It cost £6,500 and was the thirteenth pier to be built in England. Worthing Pier was successful from the beginning. In 1884, two kiosks were added on the northern end and, in 1889, a pavilion was erected on the southern end (where there was also a landing stage). There was also a scheme to build a second pier in Worthing during the 1880s but it never saw fruition. 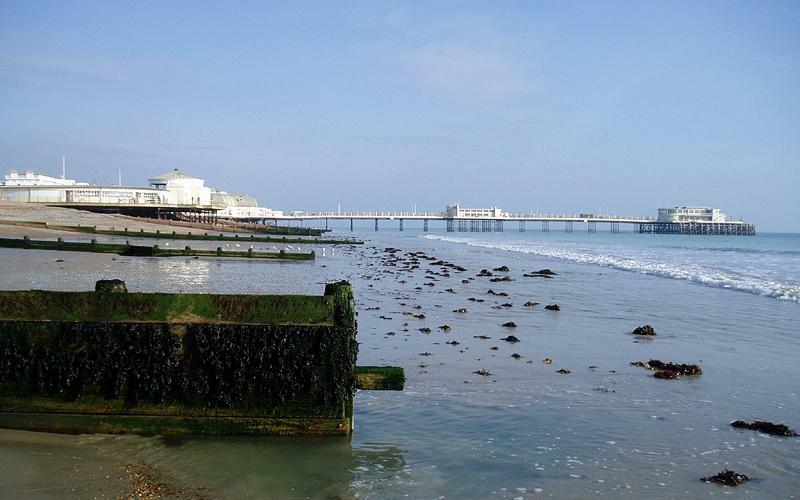 In 1921, Worthing Borough Council purchased the Pier for £18,978. 15s. In1926, the kiosks were demolished and replaced with the new 1,000 seat ‘Shoreward’ or ‘Pierfoot’ Pavilion designed by Adshead & Ramsey. This pavilion, which is still very much in use, consists of a polygonal hall with an entrance vestibule and two square side pavilions. Its most striking feature is the oval domed vestibule with Corinthian columns and round dormer windows. In 1937, an amusement pavilion was built in the middle of the Pier along with a windshield along the Pier’s spine. Like the piers of Brighton, Worthing’s has had its fair share of disasters. On Easter Monday 1913, the Pier was smashed in a storm and cut off from the land. It was temporarily nicknamed ‘Easter Island’ by the newspapers. In 1933, a fire which could be seen from Beachy Head, destroyed the South Pavilion. 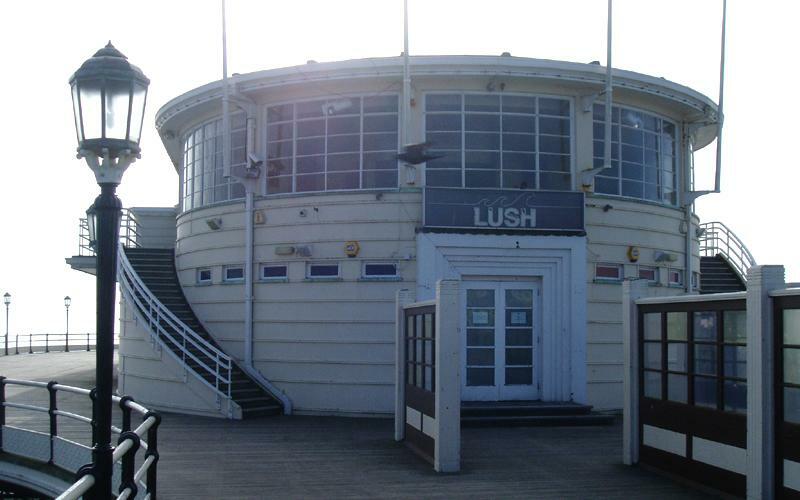 It was replaced with the Art Deco Nautical-style ‘Pierhead’ Pavilion, designed by the Borough Architect, in 1935. This pavilion is rectangular with rounded ends and a low roof. Its smooth lines are its greatest feature; emphasised by the sweeping balconies and many large windows. It is today a nightclub called Lush. In 1940, a 120ft hole was blown in the Pier’s decking. However, this was deliberate – it was to make difficult potential enemy invasion landings. In 1942, troops used the Pier’s facilities for recreation by which time invasion fears had subsided. After the war, the Government paid for repairs and refurbishment. With the current shortage of piers in Brighton, Worthing is very close to outpiering us Brightonians. And we can’t have that now!